The Trinity Annual Conference President greeted them as a “mighty throng” (referencing Psalm 68:11, NIV). They minister to persons with visual impairment, at-risk youths, and home-makers re-entering the workforce. 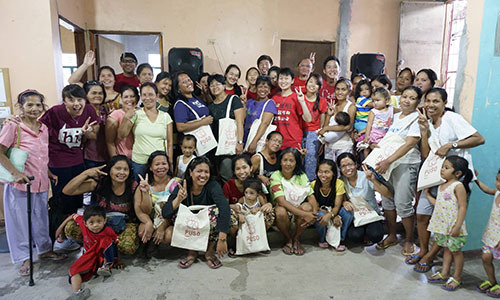 Their goal is to add value to the ministry of local churches. Who are they? I caught an inspiring glimpse of their heart for the Church when I joined the vivacious women of the General Conference Women’s Society of Christian Service (WSCS) at their Quadrennial General Meeting (QGM) from 26-28 Nov 2016, held at the Renaissance Hotel in Johor Bahru. Through observing their decisions and having heartfelt exchanges with individuals, I began to understand and better appreciate the unique role played by the WSCS in the ministry of the Church. 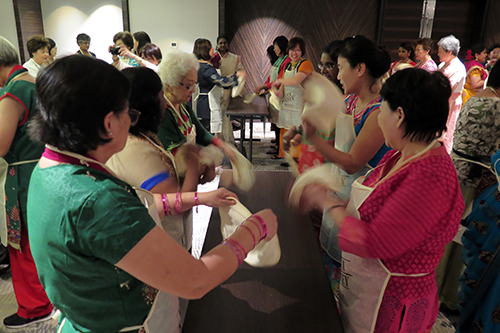 Firstly, women are already an integral part of church ministry – the Rev James Nagulan, President of Emmanuel Tamil Annual Conference, noted in his greetings that “women play multiple roles as wives, mothers, church leaders etc.” in addition to their careers. It is challenging to manage these multiple roles well, and therefore women need to come alongside and support each other. Then-Bishop (now Bishop Emeritus) Dr Wee Boon Hup shared with the delegates his prayer for them to “share the fellowship of sisters across the conference”, that they would find encouragement through exchanging stories of successes and lessons learnt – what men call “war stories”. 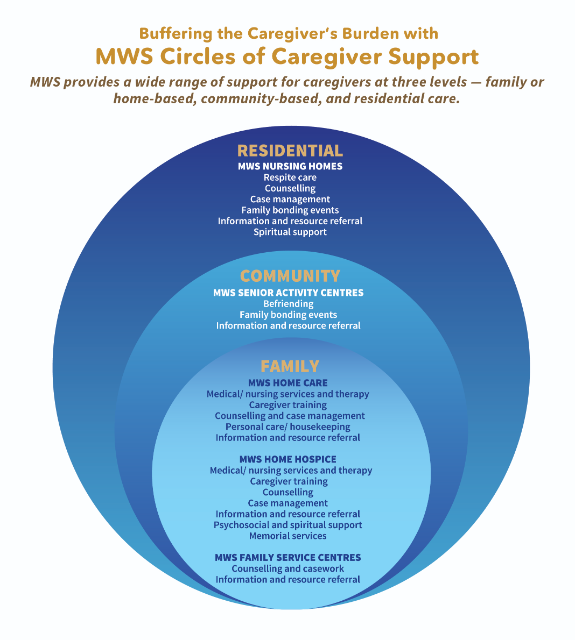 Ministry to others continues to be a key focus for the GC WSCS. One of the major decisions made at the QGM was to continue partnering the Methodist Welfare Services (MWS) in running Residence @ St. George’s (RSG), a hostel for female youth-at-risk, for a further term of three years after the existing Memorandum of Understanding expires on 19 Jan 2017. A fund-raising dinner is being planned for RSG in 2017 when it celebrates its 5th anniversary, and the hostel is sourcing work attachments for residents, as well as suitable alternative premises before its extended lease expires in 2020. 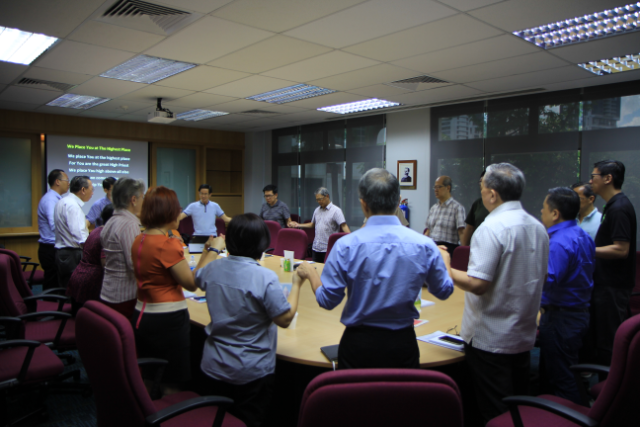 The GC WSCS Outreach & Social Concerns Coordinators also put out an appeal for volunteer drivers, to assist with transporting beneficiaries to and from the Gospel Mission to The Blind in Geylang for their weekly fellowship meetings on Saturday mornings. WSCS chapters were also encouraged to contact MWS to run its Poverty Simulation Exercise for their members. Much material for reflection and growth was provided during the QGM by outgoing Bishop Dr Wee, who preached on passages from Ephesians 5 and James 1, in addition to a highly practical teaching session on ‘The Marks of A Spiritual Leader’, and a message on ‘The Essential Ingredient for Christian Leadership’ during the Closing Service. The newly-elected Executive Committee was installed at the Closing Service, led by the new President Dr (Mrs) Teo Li Bee and Vice-Presidents Ms Deviki James and Ms Katherine Foo. Other major decisions made at the QGM included the adoption of a new GC WSCS Finance Manual, the raising of Conference dues with effect from 1 Aug 2016, and raising the maximum limit of GC WSCS’ investment funds. The GC WSCS also celebrated the 40th year since its 1976 re-constitution with a festive cake. For me, there was no better symbol of the QGM than the clay vessel resembling a candle-holder which each participant received during the Ministry Night, to decorate with a Bible verse that would direct and bring focus to our lives with regard to the QGM theme, ‘Walk in Righteousness and Truth’ (Eph 5:8-10). It remains a stirring visual reminder for each of us to be vessels of God’s light and truth, in solidarity with our fellow brothers- and sisters-in-Christ, and in united ministry to our community and the world. 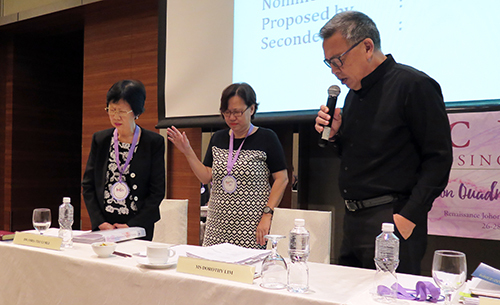 Bishop Emeritus Dr Wee Boon Hup leading in a prayer for Dr (Mrs) Teo Li Bee after her election as GC WSCS President for the new quadrennium.